According to the chief minister's wife, she, her mother-in-law, Deputy Chief Minister Manish Sisodia wife and Health Minister Satyendar Jain's wife had gone to meet them at the L-G office today. NEW DELHI: Delhi Chief Minister Arvind Kejriwal's wife today alleged that the families of the ministers, who are staging a sit-in at the L-G Secretariat since Monday evening, were not being allowed to meet them. Sunita Kejriwal said on Twitter that even prisoners are allowed to meet their family members. According to the chief minister's wife, she, her mother-in-law, Deputy Chief Minister Manish Sisodia wife and Health Minister Satyendar Jain's wife had gone to meet them at the L-G office today, but were not allowed. "Respected LG sir, are we four ladies, mother and wife of CM, wife of Dy CM and wife of Satyendar Jain threat to your security that you are not allowing us to enter the road leading to your house? Kindly intervene. Please do not feel so threatened by everyone. Regards (sic)," she tweeted. In another tweet, she said, "@LtGovDelhi sir we waited for long but denied any meeting with our family. Even the prisoners are allowed to meet their family members." Sources in the L-G office said the ministers' family members can meet them outside the L-G office as no restriction has been imposed on such meetings. 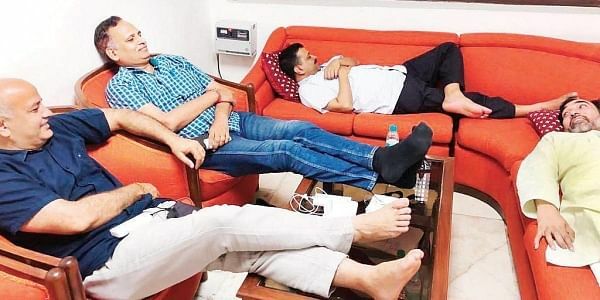 Kejriwal and AAP ministers Manish Sisodia, Gopal Rai and Satyendar Jain have been staying put at the waiting room of the L-G office over their demands, including a direction to IAS officers to end their "strike" and action against those who have struck work. In counter-protest, BJP MP Pravesh Sahib Singh Verma, three party MLAs and AAP's rebel legislator Kapil Mishra sat on dharna outside the chief minister's office at Delhi Secretariat. The general administration department of the Delhi government today ordered the removal of posters and banners put up by the BJP and Mishra following a complaint. Following a request of Opposition Leader Vijender Gupta, the department provided a TV in the waiting room of the chief minister's office. Besides Verma and Mishra, BJP MLAs - Gupta, Manjinder Singh Sirsa and Jagdish Pradhan have sat on dharna, saying they will not leave the chief minister's office till their demands are met.